Auctioneers in Cirencester knew they were on target for a high hammer price when determined bidders set their sights on on an early 19th century shotgun by the renowned gunsmith James Purdy. 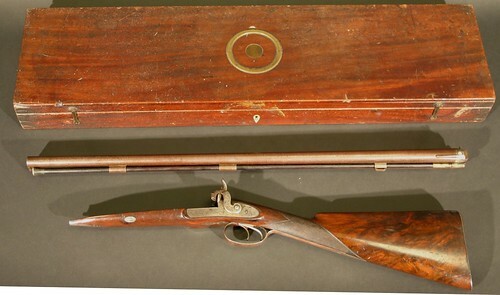 The 16 bore muzzle-loading side-by-side double-barrelled shotgun came in a mahogany case bearing the label of Joseph Manton, to whom Purdey was head stocker before setting up his own firm. Purdey have records of customers going back over 200 years, and from the serial number the firm ascertained that the shotgun was made for a Lt Hawkins in 1826. Purdey reckoned the gun to be valued at between £1,200 and £1,500, and the auctioneers were happy to recommend that guide price on the lot. So there were smiles all round when the shotgun sold for £3,200 – the top price of the day at Moore Allen & Innocent’s Sporting Sale on Friday (September 2). Over in the fishing section, an antique salmon fly reel landed the second highest price of the day, when bidders cast their lines well beyond the £500 to £800 guide price, and auctioneers netted £1,250 for a Hardy brass faced 4¼” Perfect reel. In the taxidermy section, four rhino feet, each with circular oak mounts, also achieved £1,250 – right on the nose of the £1,000 to £1,500 estimate – while an early 20th century white metal mounted elephant foot four bottle tantalus, with cut glass decanters, made £660 against a £300 to £500 estimate. 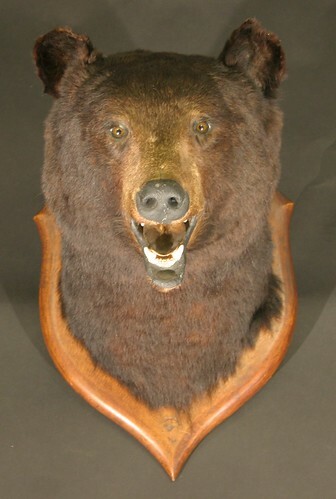 A stuffed and mounted American Black Bear head on an oak shield, prepared by the renowned Victorian taxidermist Rowland Ward, clawed its way to £780 – comfortably in excess of the £500 to £700 estimate. And a stuffed and mounted Golden Eagle in open wing stance on a log base to wooden square plinth soared to £600. In all, £58,000 worth of antiques were traded during the auction. The next sale at Moore Allen & Innocent is the antique and general on September 16, followed by two very special sales: a single owner toy sale on September 29 – when almost the entire collection of the former Park House Toy Museum in Stow-on-the-wold will go under the hammer – followed by the auction of the crème de la crème of antiques at the Selected Sale the following day.